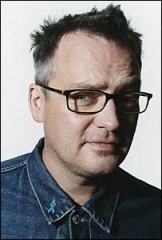 Charlie Higson is back with The Enemy, the first in a series of action horror books to be published in the UK by Puffin Books. No release date was mentioned, but a “major deal” was recently made between Puffin and Disney-Hyperion at the Bologna Book Fair where Hyperion secured the rights to publish the book in the United States. Hyperion was said to have read the whole book and made the decision in just one weekend. This will be Higson’s first non-Bond since the completion of his five part Young Bond series.